A fragment of a glass bracelet or bangle of Roman date, probably 1st century. It is of angular D shaped (or triangular) section and is a translucent light blue colour. It is decorated with two hook shaped designs in opaque yellow glass, probably trailed into the blue glass and then smoothed. The shaft of each hook runs along the apex of the D and then the hook bends down the side of the bracelet, becoming broader. The bends of the two hooks curve in opposite directions and do not meet, but are separated by a narrow gap. The fragment is 39.5mm long, 13.6mm wide and 8.3mm thick. It weighs 7.12gm. Similar bracelets can be found on the database; see for example references YORYM-7325B6, FAKL-C8D895 and SWYOR-65B384, but these have a raised ridge of cable decoration along the apex. 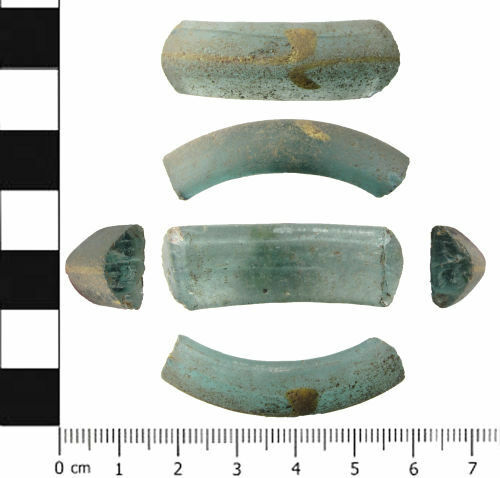 Similar bangles are also described in "Roman Castleford" (Cool and Philo, 1998, page 189): "Numbers 225 and 227 are both deep blue and decorated with opaque white and yellow trails and pothooks and are thus examples of [Kilbride-Jones] type 3I/J". The Castleford examples come from contexts dated AD 71 - AD 86.